Pictured from left to right, San Bernardino County Elections Office staff members: Ashleigh Bachar, Roxana Castro, and Travis Weaver. Photo courtesy of San Bernardino County, Calif. Problem: The spread of cameras in cell phones made some voting officials uneasy about potential violations. Solution: San Bernardino County, Calif. officials established a separate area for taking selfies with ballots. After years as the industry leader, the “I voted” sticker faces a digital disruptor for its role as civic badge of honor — the voting selfie. Audilia Lozada points to singer Justin Timberlake’s Instagram post of his Shelby County, Tenn. ballot in the 2016 general election, as the time when the practice reached a flashpoint. Lozada is the chief deputy registrar of voters for San Bernardino County, Calif. Responses to Timberlake’s post were swift — he broke his local election laws and could be fined $50 and jailed for up to 30 days. The county chose not to prosecute the misdemeanor, but it raised questions across the country — could people share their voting experiences with others? That issue takes on increased relevance after fellow musician Taylor Swift appealed to her fans to register to vote in an Instagram post that garnered more than 2 million likes. The enthusiasm for voting, born through social media, may soon manifest itself in others channeling that zest. The “Election Selfie Program” is the recipient of a 2018 NACo Achievement Award in the Civic Education category. Does your county have an innovative program that improves county government and enhances services for county residents? Apply for the 2019 Achievement Awards! Lozada said San Bernardino County had looked closely at how social media could be both a tool and a hazard in encouraging voter participation, even before Timberlake’s dustup. A 2012 study published by the journal Nature found that the closest Facebook friends exerted the most influence in getting users to the ballot box. Before 2016, the San Bernardino County Registrar of Elections’ staff decided it was better to be safe than sorry. So they hit the books, scrutinizing the common assumption that cameras were forbidden. After further review, the registrar’s staff found that that was merely an interpretation of the law preventing photography of other people’s ballots. “The law was written to say you couldn’t take pictures of things like other people voting,” Lozada said. “It was written in a way that focused on protecting people’s privacy, but you yourself could take a picture of your uncompleted ballot. But state law did say that voters were prohibited from revealing the contents of their marked ballot to anyone else. Analysis by the Associated Press found that ballot selfies were definitively illegal in 16 states, legal in 22 and the District of Columbia and unclear in 12, including California. If voters were to take their selfies, it would have to be before they marked their ballots. And, it would have to be done in a way that wouldn’t disturb other voters who didn’t want to partake for themselves. 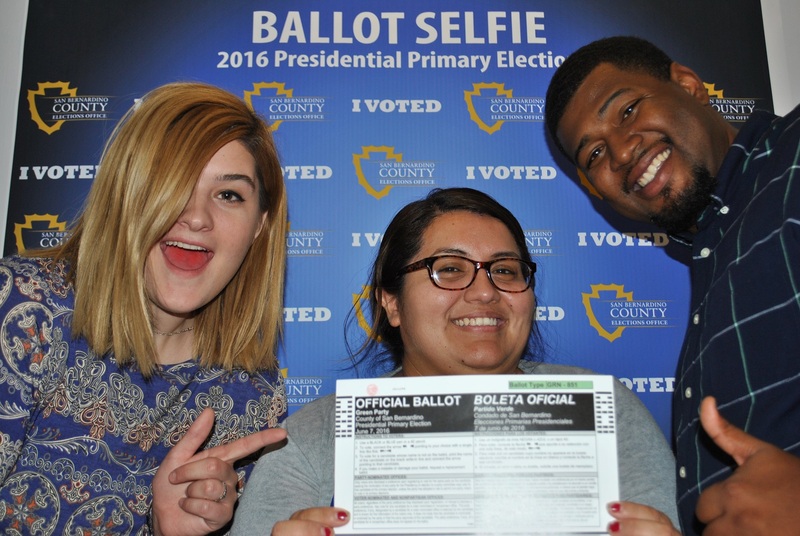 For the June 2016 California primary election, the county debuted branded “Ballot Selfie” backdrop posters, distributing them to polling places. Along with those posters, instructions warned voters against photographing others or their own completed ballots. The county also promoted hashtags, including #ballotselfie and #SBCVote2016. Voters who received ballots by mail also found instructions on how they too could legally take ballot selfies. The county also printed “candidate filing selfie” and “voter registration selfie” posters to cater to those smaller, but influential groups. Those posters cost just under $6,000 to print. The “I Voted by Mail” stickers, by comparison, cost more than $17,000.